First unveiled in May, Foxconn has announced that its fanless nettops will finally ship in September after a brief delay possibly related to the cancellation of Intel's Atom D2700 processor, which was originally expected to appear in one of the models. The Nano PC will be available in two variants: the AT-5250 with a dual-core 1.86GHz Intel Atom D2550 and the AT-5600 with a dual-core 1.65GHz AMD E-450. Both chips have integrated graphics, with the AMD's Radeon HD 6320 undoubtedly having an edge over Intel's solution, albeit at the expense of a higher TDP (10W for the D2550 versus 18W for the E-450). The extra graphics performance might not matter much if you only plan to use the system for basic tasks, in which case, the lower-TDP model might be a better choice given the reliance on passive cooling. The machines are housed in what appears to be a brushed aluminum enclosure that measures 7.48 x 5.31 x 1.49 inches (190 x 135 x 38mm). 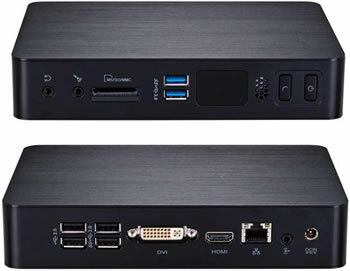 The systems also share other specifications, including two USB 3.0 ports, four USB 2.0 ports, a 5-in-1 card reader, gigabit Ethernet, 802.11n Wi-Fi, HDMI and DVI outputs, headphone and microphone jacks, as well as VESA compatibility for rear display mounting. You'll have to supply your own storage and memory. Foxconn says 2.5-inch and 1.8-inch drives are supported, though it's unclear how many (plural wording is used but the text is translated from Russian so errors are likely). You can also add up to 4GB of DDR3 RAM via one SO-DIMM slot. Pricing is higher than reported in May, with the Intel system set at $260 and the AMD unit costing a tad more at $280.